He is one of Yugi’s best friends and slowly develops himself into one of the best duelists in the world of Yu-Gi-Oh! 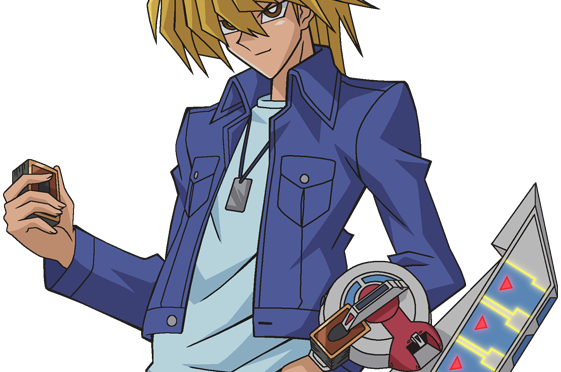 Along with his tight pack of friends, Yugi, Anzu (English: Tea), and Hiroto Honda (English name: Tristan Taylor) they journey to the Duelist Kingdom and Jounouchi, despite not being invited, is lent one star chip by Yugi and officially becomes part of the Duelist Kingdom tournament. He duels for his sister in this tournament, because she has an eye disease that will eventually cause her to go blind. With an expensive operation though, she can be cured. On the boat to Duelist Kingdom, Jounouchi (Joey) is lent the rare Time Magician (English: Time Wizard) card when Yugi sees he has traded for the Baby Dragon card. Jounouchi trades for some really major magic cards that save his behind later in the Duelist Kingdom tournament. When they first land on the island, Jounouchi dueling skills are a joke, and not only that, but his first duel is against the skilled, Mai Kujaku (English: Mai Valentine). She starts to pretend she has psychic abilities and starts to mentally put Jounouchi off his game. With some help from Yami Yugi, Jounouchi eventually realizes Mai just put different perfumes on her cards, and with a quick play of Time Magician, aging Harpy Ladies, and turning Baby Dragon into Thousand Dragon, wins one of Mai’s starchips. Jounouchi then comes across Dinosaur Ryuzaki (English: Rex Raptor), who is pushed to duel Jounouchi because he wants to duel Mai. In this duel, Ryuzaki starts pounding through Jounouchi’s deck with pure dinosaur beat down. Jounouchi eventually draws the Flame Swordsman, and starts slicing through Ryuzaki’s dinosaur sub-types. Ryuzaki then draws his Evilknight Dragon (English: Serpent-Knight Dragon) and disposes of the Flame Swordsman. Jounouchi eventually plays Barbarian #1 and Barbarian #2 (English name: Lava Battle guard & Swamp Battleguard) which repels Evilknight Dragon’s attack and destroys itself. Ryuzaki then plays one of the most popular cards in Yugioh and perhaps one of the most feared, the Red Eyes Black Dragon. Not only that, but Ryuzaki attaches the Dark Dragon Claws, raising its power to 3000, the exact Blue Eyes atk strength. Red Eyes incinerates the Barbarian duo, and Jounouchi is backed into a wall, while Ryuzaki strikes a bargain with Jounouchi, saying whoever wins gets the cards on the field. Jounouchi agrees and is reminded of the Time Magician on the field. He uses it, and Ryuzaki loses the duel. Jounouchi then comes across some other tough situations including his duel with Ghost Kotsuzuka (English name: Bonz/Bones), where he uses the Shield in the Right Hand, Sword in the Left Hand (English: Sword and Shield) magic card to dispose of Kotsuzuka’s undead type monsters. He then tags with Yami Yugi versus the Labyrinth Brothers, Mei and Kyuu (English: Paradox Brothers, Para & Dox), where Red Eyes fuses with Summoned Skull and forms the Black Skull Dragon. Jounouchi makes it all the way into the finals, where now he is a seasoned duelist. In the Duelist Kingdom semi-finals he faces Bandit Keith Howard (English: Bandit Keith). In his Duelist Kingdom semi-final match, he encounters Keith’s Machine deck. At first, Jounouchi tries to fight with his magical monsters, but finds out machine monsters have a natural resistance to magic monsters (Note: Applies only to anime, not CCG). This puts Jounouchi in a tight situation. Keith then reveals his Devilzoa monster card along with a trap, Metal Conversion – Magic Reflex Armor (English: Unknown, it could be Metal Force or Metallize). This turns Devilzoa into Metal Devilzoa, with the insane strength of 3000. This is when Jounouchi makes his comeback, activating Pit Trap destroying Metal Devilzoa, and then starts going through Keith’s deck. Jounouchi plays Baby Dragon along with Time Magician, aging Keith’s Revolver Dragon (English: Barrel Dragon), and turning Baby Dragon into Thousand Dragon, but Keith activates his Time Machine trap card, bring back Revolver Dragon and annihilating Thousand Dragon. With a quick play of the Red Eyes Black Metal Dragon and Dark Dragon Claws (Atk str: 3400) he kills Revolver Dragon. Keith destroys REBMD, but Jounouchi uses Grave Digger to copy Keith’s Time Machine trap, reviving Red Eyes and defeating Keith. Jounouchi loses to Yugi in the Duelist Kingdom finals, but Yugi gives him the claim to the prize money if he wins so Jounouchi can help his sister. Yugi goes on to defeat Pegasus, and Jounouchi gets the operation done for his sister, Shizuka Jounouchi (English: Serenity Wheeler). He helps Yugi in the side story arcs between Duelist Kingdom and Battle City, and eventually participates in the Battle City tournament. He faces a Rare Hunter from the organization that wants the god cards, and Rare Hunter defeats Jounouchi because Rare Hunter plays with an Exodia deck. Yugi duels and defeats Rare Hunter and getting Red Eyes back, but Jounouchi doesn’t accept it. Jounouchi plays with a basic Warrior/Beast Deck, with a mix of luck cards like the Time Magician. Red Eyes immensely helps him in Duelist Kingdom, but in Battle City he gains some really awesome cards for his deck. He gains Android: Psycho Shocker from defeating Esper Roba, and Legendary Fisherman and Fortress Whale from Ryouta Kajiki (English: Mako Tsunami).